Why did you change to Camels, LINDA DARNELL? “After smoking Camels for 30 days, I found they get along wonderfully with my throat. 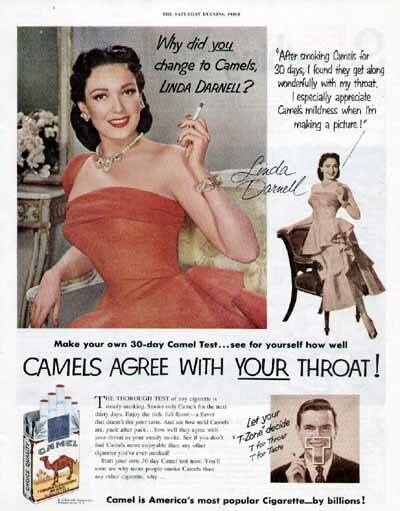 I especially appreciate Camel’s mildness when I’m making a picture!” - Linda Darnell Make your own 30-day Camel Test…see for yourself how well CAMELS AGREE WITH YOUR THROAT! Camel is America’s most popular Cigarette – by billions! Why did you change to Camels, HENRY FONDA? “My voice is important in my career. 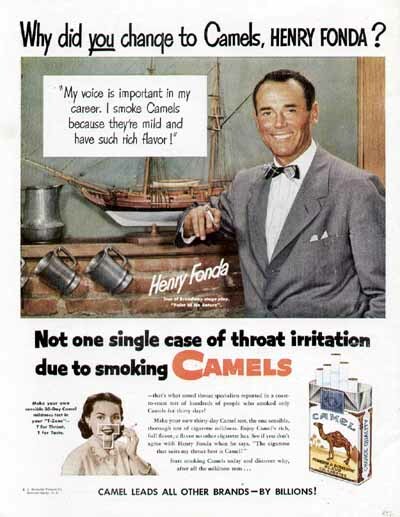 I smoke Camels because they’re mild and have such rich flavor!” - Henry Fonda Not one single case of throat irritation due to smoking CAMELS CAMEL LEADS ALL OTHER BRANDS – BY BILLIONS!